Here at Pangea Dreams we’re all about travelling and exploring unique destinations around the world. Our retreats are hosted in several incredible locations, ranging from Bali and Thailand to Greece and Mexico. We just love travelling, and if there’s one thing our alumni have in common, it’s that they are all jetsetting around the world, sharing their experiences and tips, and even meeting up whenever their paths cross! We love this about the Pangea Dreams community, and we are so happy to see it. The more you travel, the more you develop certain habits and preferences around your trips. Some can’t make it more than 1 hour in an airport without finding a lounge, while some always travel with the exact same snack and drinks combination to keep them hydrated and well. In addition to these habits, frequent travellers have certain items and gadgets they swear by, and we are no exception! Since we often get asked what gadgets we travel with, we thought we’d share them all in a list here on the blog! Naturally, this list is a little different for everyone, but we hope you can use it as inspiration when you start figuring out what your must-have items for travel are! Can’t go anywhere without it! Whether we are travelling for a collaboration, and are expected to create content for a brand or a hotel, or if we are just travelling for a holiday – the camera has to go too. There are just so many stunning locations to shoot and memorable moments to capture and share. We always make sure to pack our camera in our carry-on, to make sure it makes it safe and sound through the trip. Depending on the length of the trip, and what kind of activities we have planned, we’ll also pack extra battery packs and lenses, waterproof housing (if needed), and a decent camera bag. This gets its own mention on the list, because it is one of our favourite things. When you are travelling alone, and especially when doing a collaboration, you still need to make sure you get the right shot and the content the hotel/brand is looking for. So, instead of placing your camera carefully on a ledge or balancing on a pillow on top of the table (we’ve all been there), a tripod is what you need. Most tripods can be folded and take up almost no space in your suitcase. It will seriously make your life easier, and is an absolute must for us when we are travelling. As you know, you can’t bring water through airport security. Most people end up buying water at the airport, but one of our favourite hacks to save some $$$ is bringing a reusable water bottle. There are plenty of great ones to chose from, such as the popular Swell bottles and similar ones, that can keep your water cold for up to 24 hours. Another popular reusable water bottle are the foldable ones, which are made of very soft plastic. These can be folded up and clipped together and take up almost no space in your carry-on. Whatever you prefer, bringing a reusable water bottle is not only the cheaper option, but also the more sustainable. Running out of battery while travelling is the absolute worst, and not all airlines have come as far as having USB chargers by every seat. There are also airports where they only have a limited number of charging stations available. By packing a fully charged power bank, you know you’ll be able to charge your phone if necessary. The secret to travelling well is being able to catch up on your sleep anywhere and any time. With a good neck pillow and an eye mask (for long haul flights some airlines will provide sets with eye masks, headphones and socks) you can make yourself (more) comfortable regardless of where you need to sleep. Whether that’s on the airport floor, on a bus or up in the air – make sure to back whatever you need to sleep. Seriously, once you try these, you’ll never be able to go back. Flying is a completely different story with these in your carry-on, and you’ll be able to get some more sleep than you’re used to. The noise levels on board airplanes is insanely high, even though you may stop noticing when you’re at 30000 feet for a longer period of time. Investing in some noice cancelling headphones will really help block out those sounds, and give you some much needed rest. It’s also better for your ears, so even if you’re just watching a movie on the plane, you’ll be absolutely golden with these! Have you ever looked for something specific in your carry-on bag (like a chapstick), only to end up sitting on the floor of the airport rummaging through it without finding it? We’ve all been there. That’s why we always organise our carry-on stuff in different make-up bags and pouches! One for chords and chargers, another for those tiny items you can never find, like the chapstick, and another for all your important documents and itineraries. Separating your stuff into smaller compartments like this makes finding what you need so much easier! Now tell us, what are YOUR favourite travel gadgets? Do you have any items you never travel without? Leave them in the comments below! 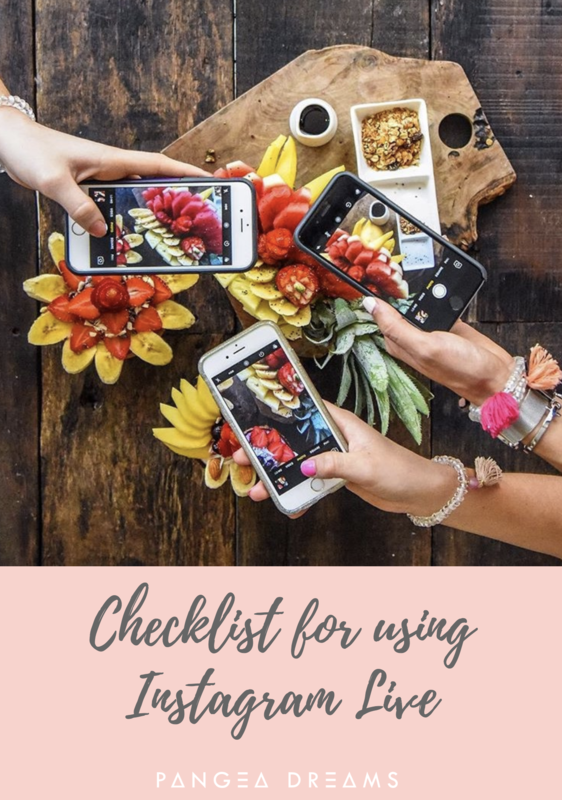 Checklist for using Instagram Live! You’ll be added to our email list where we send tips & advice, blog posts, updates and inspiration. We won’t share your information with anyone. Unsubscribe at any time!